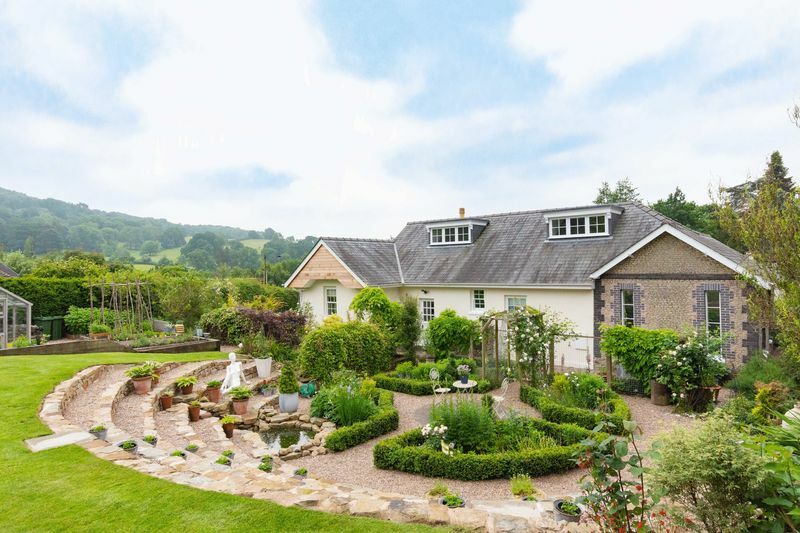 A unique, detached 4 bed character property, lovingly restored to an exceptional standard, with uninterrupted views over the Malvern Hills. ‘Timbrells’ offers a wealth of character, with a considerable sense of style and space. It has been tastefully restored to offer a contemporary feel, with a sympathetic approach, highlighting its splendid, original features. 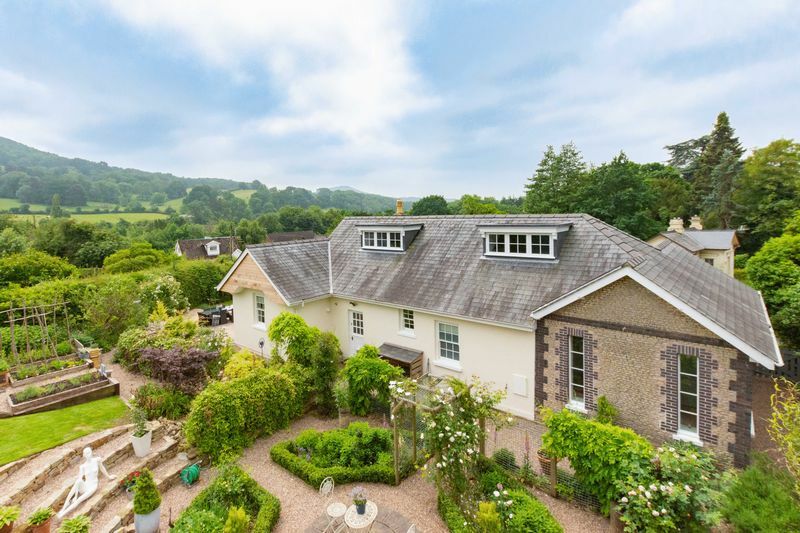 The property itself was originally constructed in the 1850’s and was one of the first to be built by the Ballard family, highly regarded in the area of Colwall. A highlight of this splendid property is the natural flow between inside and outside living, with the truly enviable landscaped gardens and terraces. 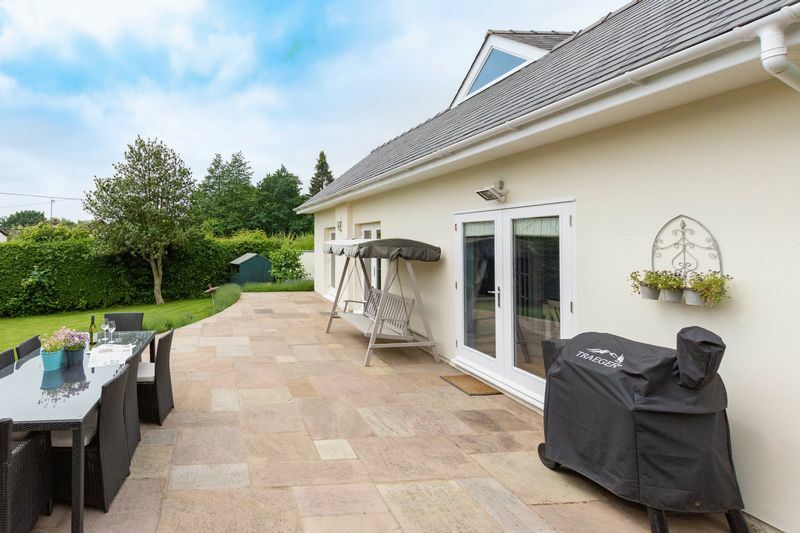 The property is situated in the highly desirable village of Colwall, offering a myriad of amenities, including, a well-stocked village store; chemist; Post Office; doctors’ surgery; hotel; café; butchers shop and two pubs. In addition, a main line railway station, offers direct services to Birmingham New Street and London Paddington. 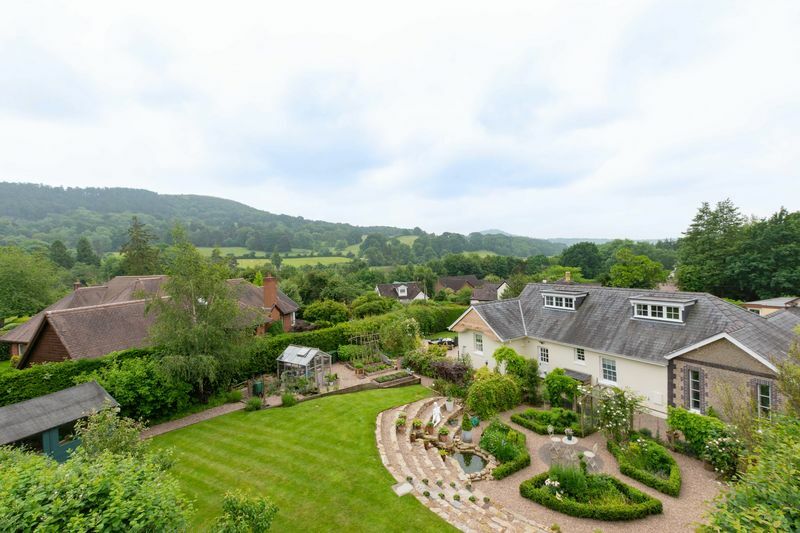 With its highly regarded independent schools, as well as a popular village primary school, this sort after location is just 2 miles from Great Malvern, offering more extensive retail and cultural opportunities. With excellent transport links the M50 (Jct 2) and M5 (Jct 7) are approx. a 15 minute drive away. 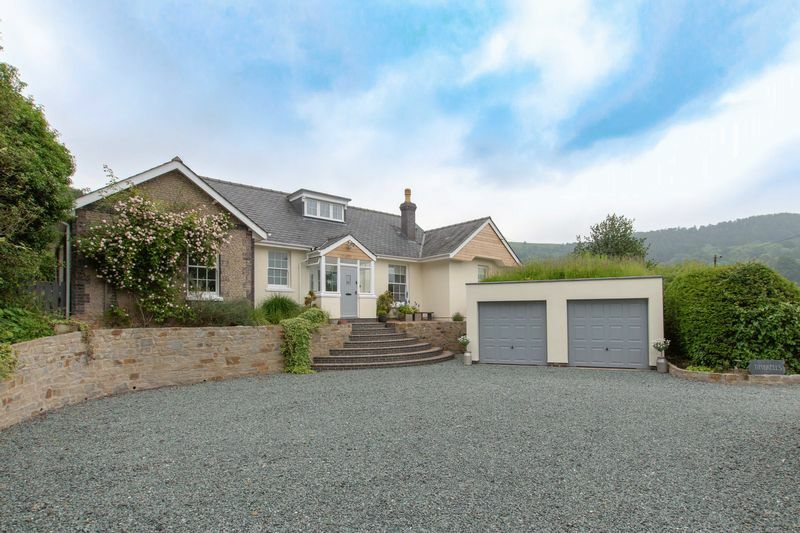 Entrance – The property is approached via a large gravelled driveway, framed by an attractive stonewall with mature hedging and shrubs. 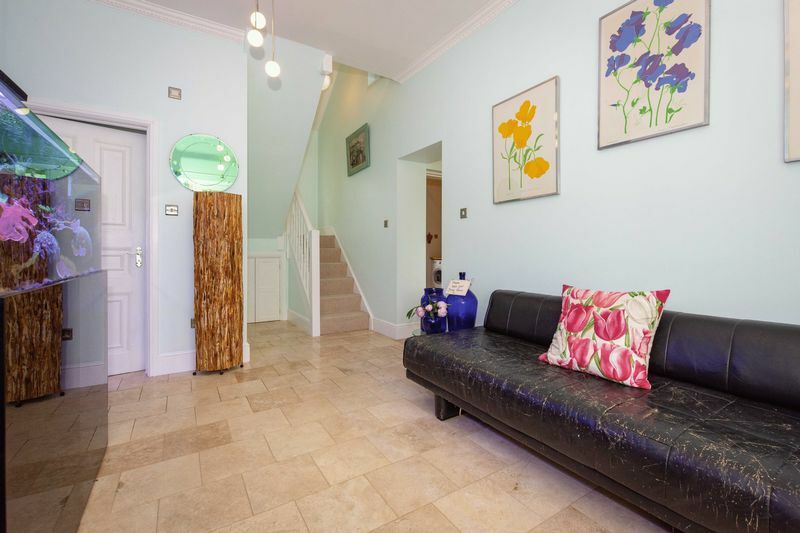 There is parking for several vehicles and charming semi-circular stone steps lead to the front door of the property. The entrance is surrounded by natural stone slabs and gravelling, with a variety of grasses and pretty potted plants, as well as a beautiful climbing rose, framing the left wing of the property. 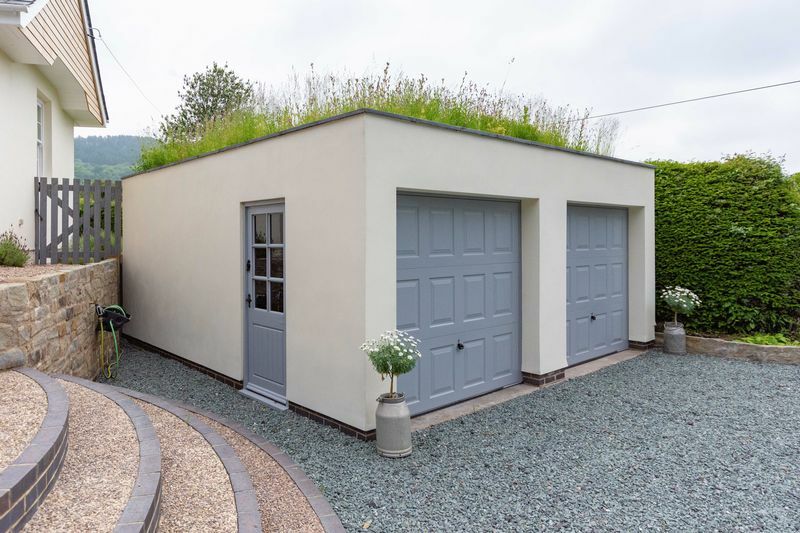 There is a detached double garage to the right, with two electrically operated remote controlled up and over doors with a beautiful wildflower roof, in keeping with the environment. Internally there are LED lights, racked shelving and a work-bench. 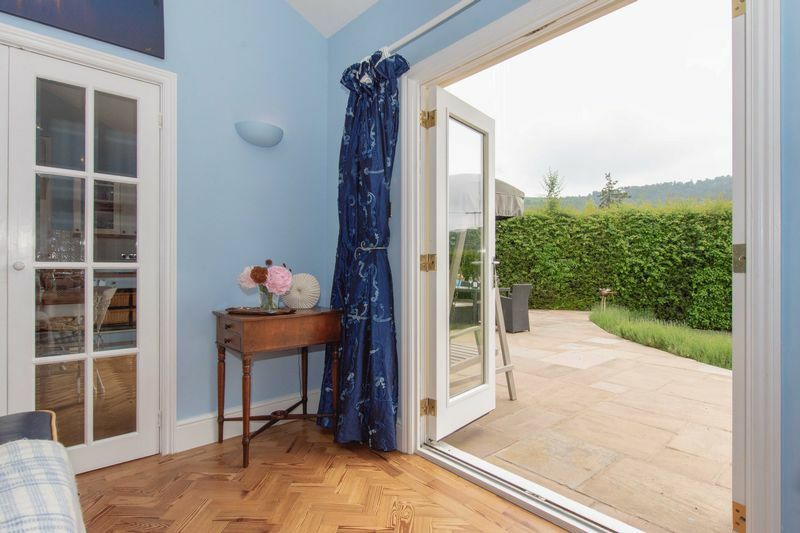 Porch – Through the wooden panelled entrance door, you arrive in a bright and practical porch, with travertine flooring, the room is mainly glazed giving a light, modern perception. 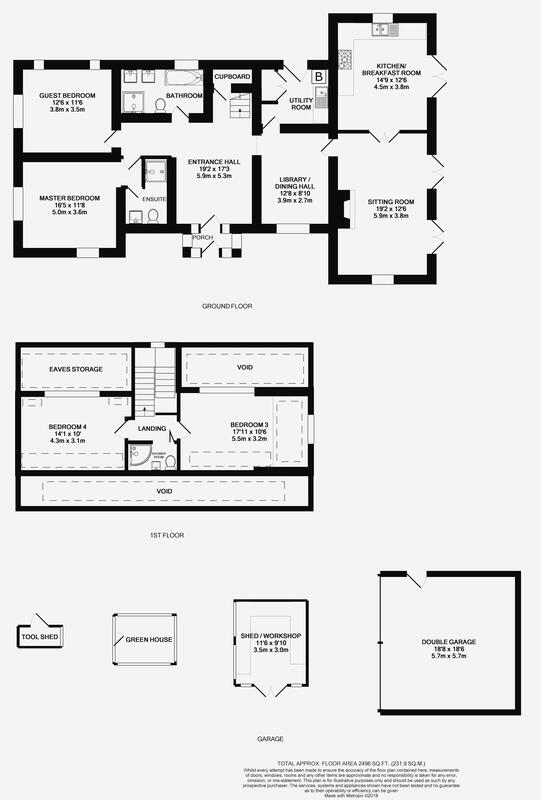 Reception Hall – Double glazed and wooden double door with side lights leads from the porch into the capacious reception hall, with high ceilings, modern down lighters and travertine stone flooring, benefitting from under floor heating. The hallway offers a fresh, contemporary feel, making the most of the open space available. Library / Dining Hall – To the right of the reception hall and through an archway, you enter the library, with underfloor heated travertine flooring continuing through this room, which can be zone controlled. 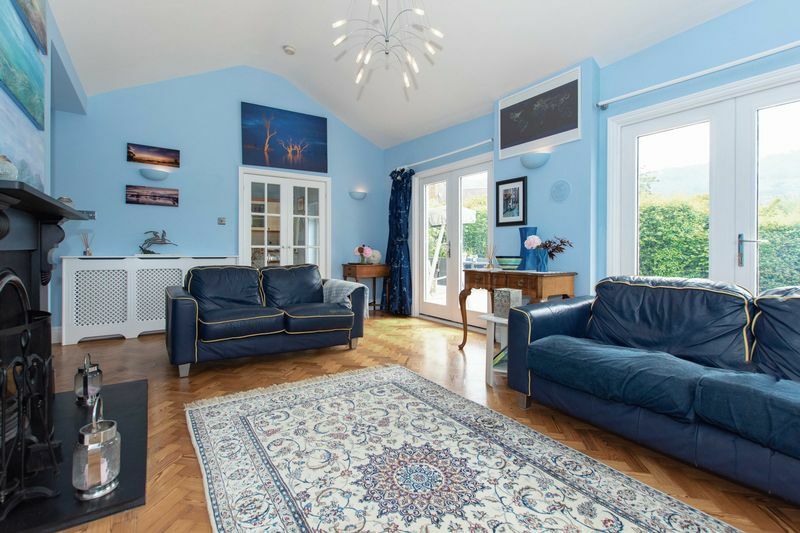 The area is flooded with natural light from the South facing sash window, in addition to the high ceilings. 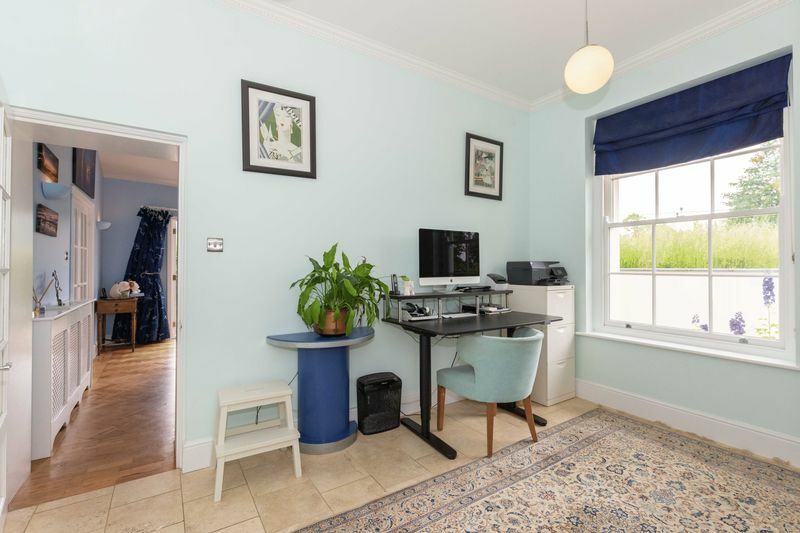 Making the most of the charming character this property has to offer, the ceiling is surrounded by Egg and Dart cornicing, with a handsome floor to ceiling bookshelf, in keeping with the rest of the room. Utility / Boot Room – A practical and convenient room for country living, the utility is located to the left of the library. 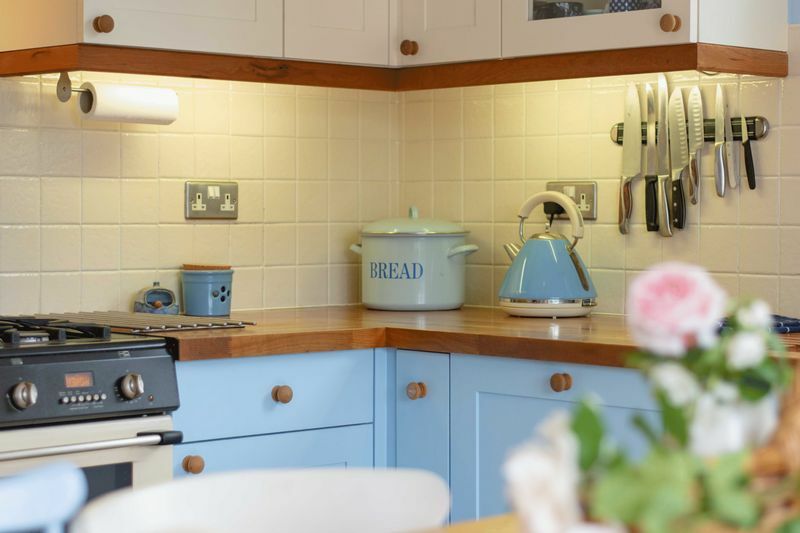 If offer a range of storage units with wooden work tops, sink and drainer with mixer tap and additional filtered water tap, space for white goods and a classic Pulley maid. In addition, a generous, floor to ceiling storage cupboard housing the Vaillant gas fired central heating boiler. A double glazed and wooden stable door leads to the rear of the property. Once more zone controlled underfloor heating with travertine floor continues through the property. 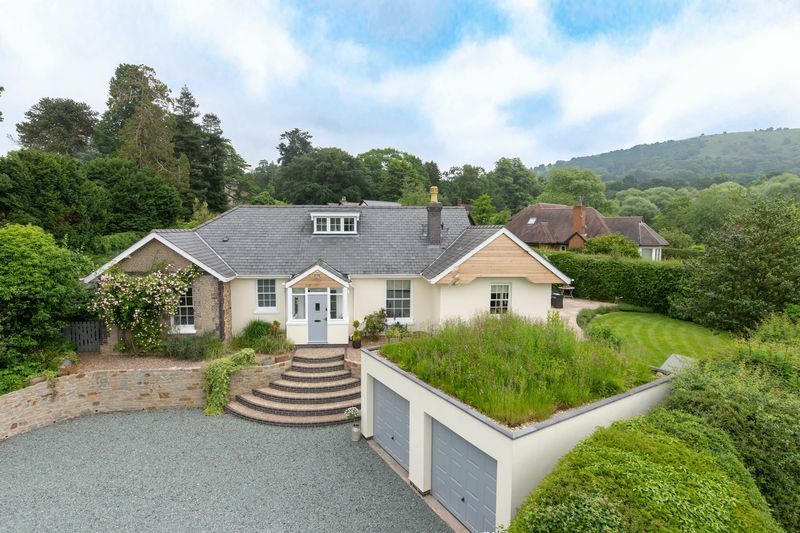 Sitting Room – Proceeding through the library, you enter a vaulted, stylish room, with an abundance of light, from the 2, double French doors, leading out to an Indian Sandstone terrace, which enjoys spectacular views of the Malvern Hills. The Sitting Room is filled with character and gives a fresh and relaxing feel. The wooden parquet flooring adds a natural ambience, with the focal point being the original slate Victorian fireplace, hearth and mantle. Radiators are tastefully concealed behind attractive timber lattice covers, with an elegant central ceiling light. Offering convenience, the wall mounted uplighters are wireless, remote control, with wall mounted KEF speakers for a home cinema system, with a range of concealed shelving units to match the radiator screening. Glazed doors lead through to the kitchen. 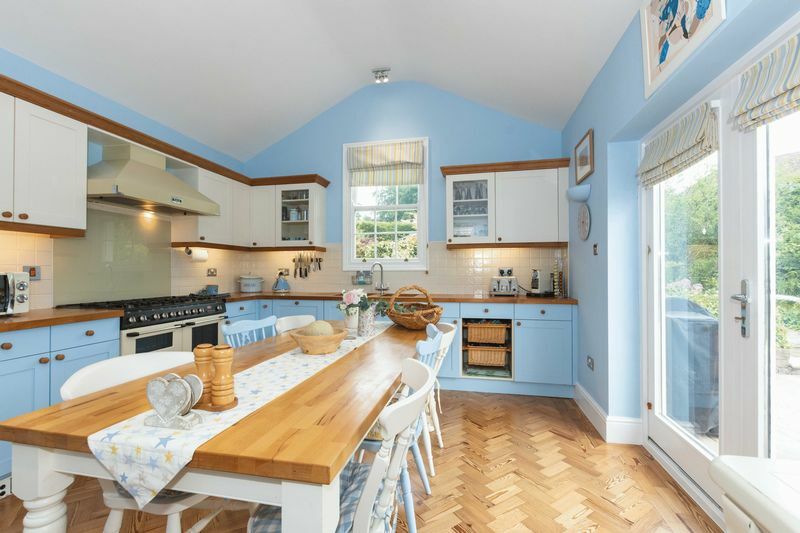 Kitchen / Dining Room – The sitting room leads naturally through to the kitchen/dining room with the wooden parquet flooring continuing through the double wooden glazed doors. 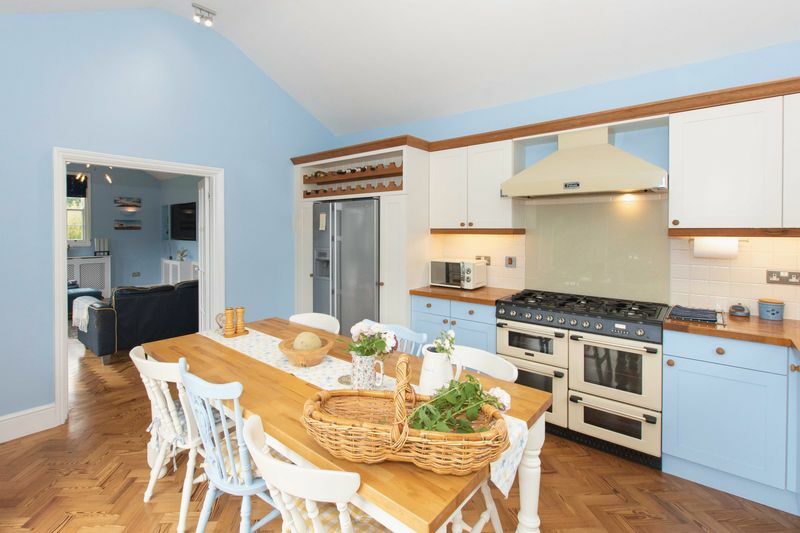 This bespoke, farmhouse style kitchen, offers a beautiful bright space to dine, with vaulted ceiling, it is ideal for modern family living. 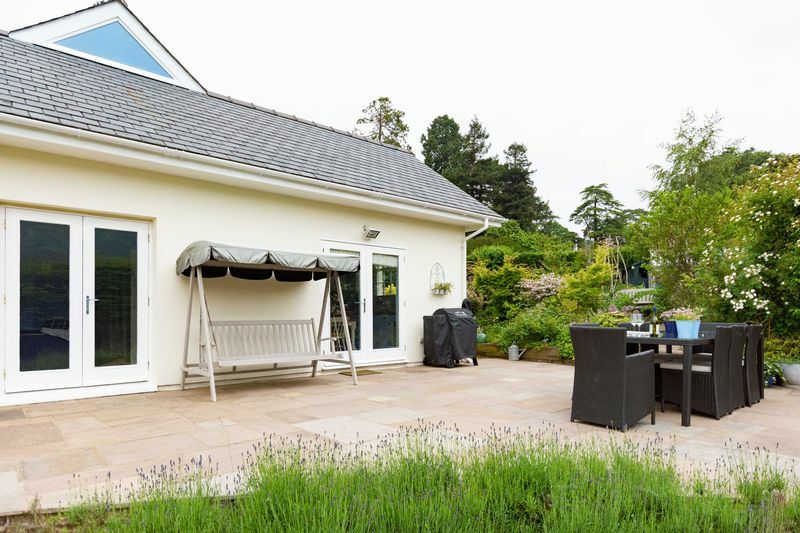 With double French doors, offering an easy transition to alfresco dining, leading out to the secluded, raised terrace, drinking in the breathtaking views. The kitchen is made up of a variety of shaker style soft close units with wooden worktops, cornicing and pelmets. There is an integrated wine rack (at head height), a double ‘Franke’ ceramic sink unit with mixer tap, space for integrated, American style fridge/freezer with chilled water and ice dispenser, with larder units either side of it. The Canon 4 door range cooker has a 6 ring gas hob, with glass splashback, Falcon extractor over with concealed lighting. 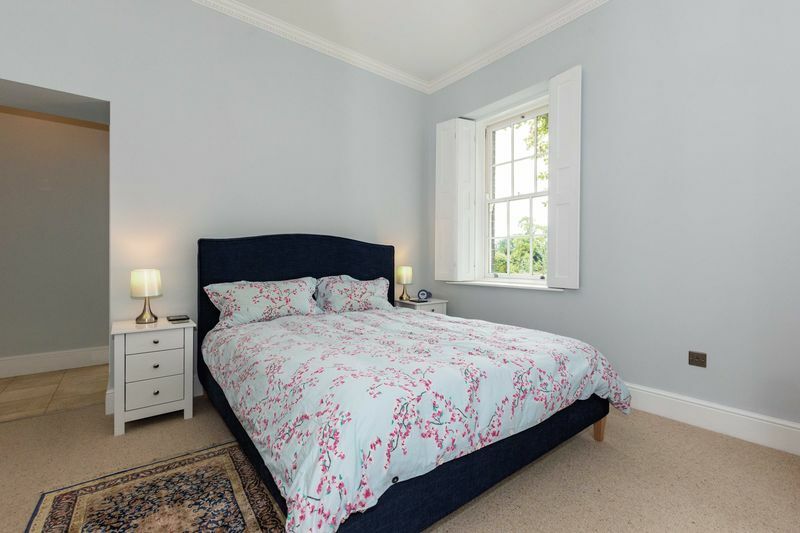 Master Bedroom – Located on the ground floor to the left of the reception hall, the Master Suite is bright and full of style and character, with handsome Egg & Dart cornicing and high ceilings, it offers a sense of space and light. 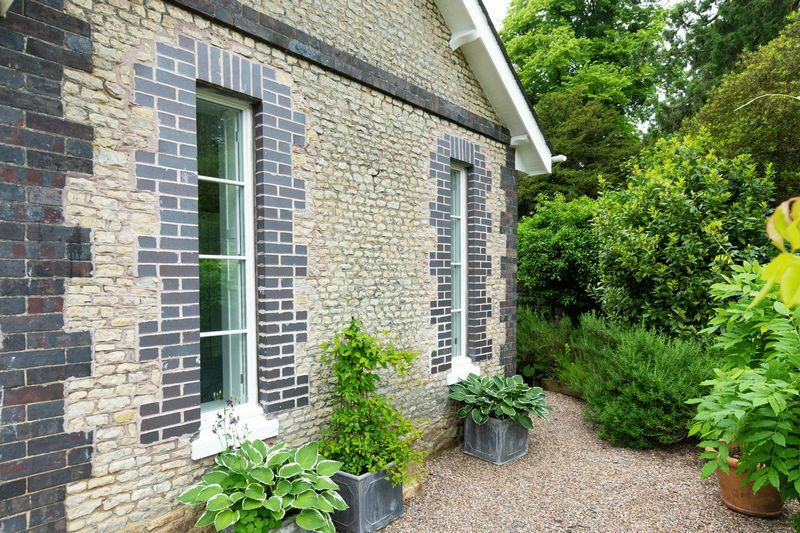 Benefitting from a large wooden framed sash windows and original working shutters, this double aspect room, offers an outlook to the front and side of the property and overlooks a wondrous array of mature flowering plants and shrubs. There is under floor heating with neutral 100% wool carpets. To the entrance of the master room, travertine flooring continues into the en-suite bathroom. 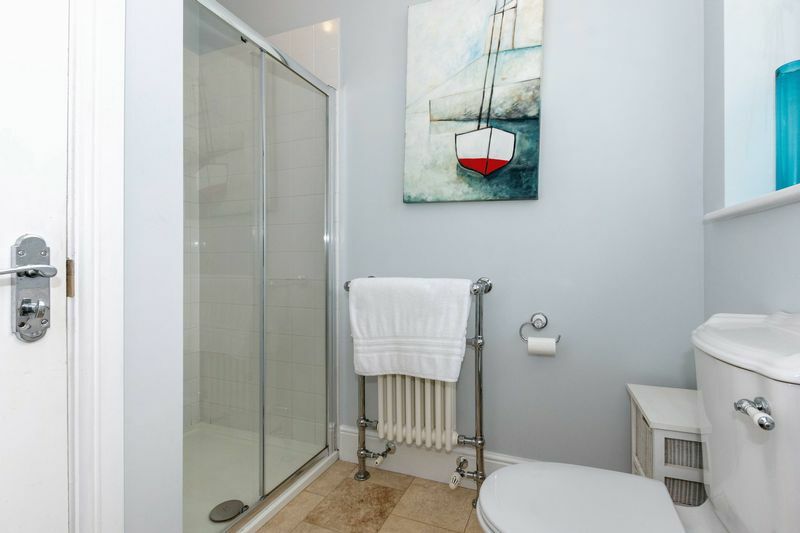 The white Victorian style bathroom suite comprises of sink, W.C. and shower unit with light over. 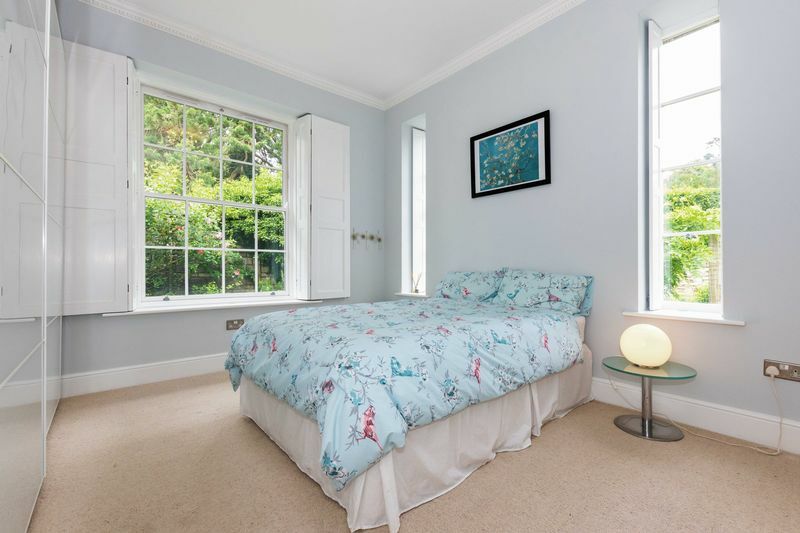 There is an obscure sash window allowing natural light into the room. Bedroom 2 / Guest Room – A charming room located on the ground floor to the left wing of the property, with high ceilings, it offers a unique feel with two ‘arrow slot’ wooden framed windows either side of the bed, overlooking the main garden. 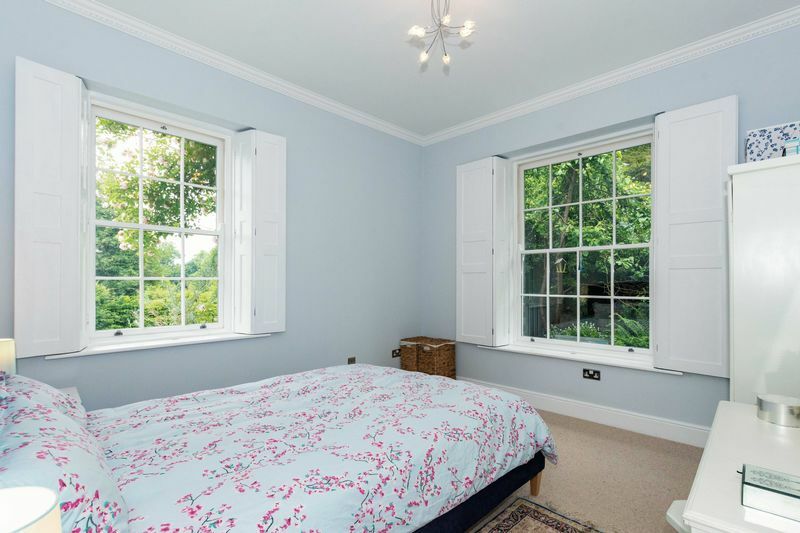 The large sash window in the room with original working shutters, allows for an abundance of light and gives the room an intriguing aspect, overlooking a well thought out garden area, filled with roses, hosta’s and ferns. In addition, there is a large, modern fitted wardrobe, with sliding doors, internally it benefits from a drawer unit, basket drawer storage, shelving and hanging space. Family Bathroom – The family bathroom leads off the main reception hall and feels sumptuous and contemporary with a Victorian style, white bathroom suite. The lower half of the walls are white painted panels, giving the room a modern feel. There is an integrated floor to ceiling shelving unit and an opulent, roll top, free standing bath with mixer tap and shower attachment. 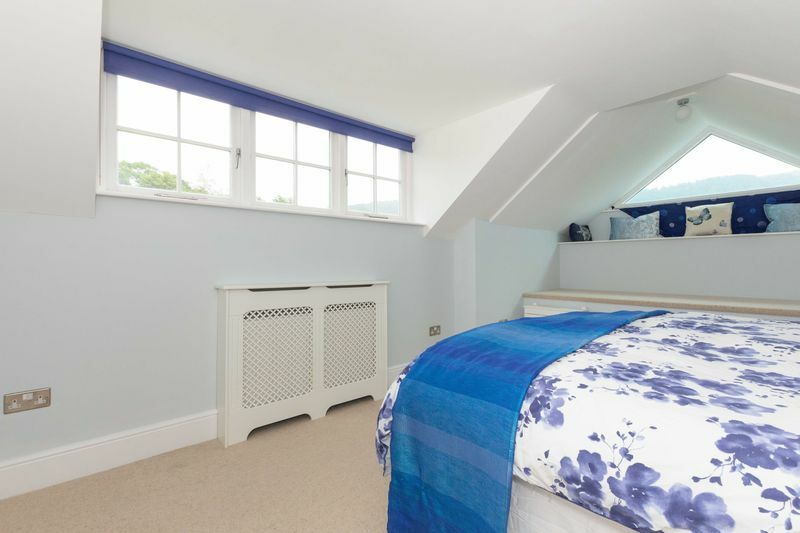 Above the bath an obscured sash window allows natural light to flood in, with a fitted roman blind. ‘His’ and ‘hers’ sinks with matching mirror fronted cabinets above each and a curved, double, walk-in shower enclosure with rainfall shower and separate attachment. Travertine under-floor heating throughout. Stairs from the main reception hall lead to a bright half landing with wooden bannister and modern down light to the ceiling, a sash window overlooks the rear garden. Further steps lead up to the first floor of the property. 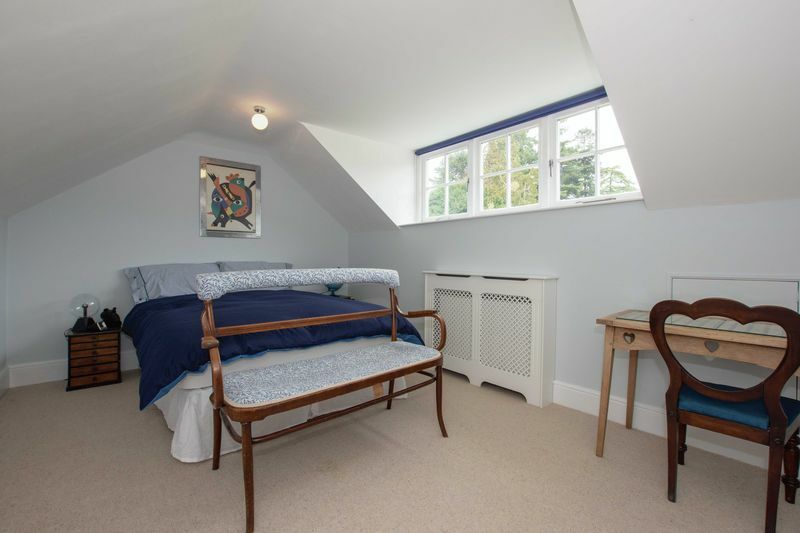 Bedroom 3 – To the left of the small landing, you enter an intriguing and spacious double bedroom. 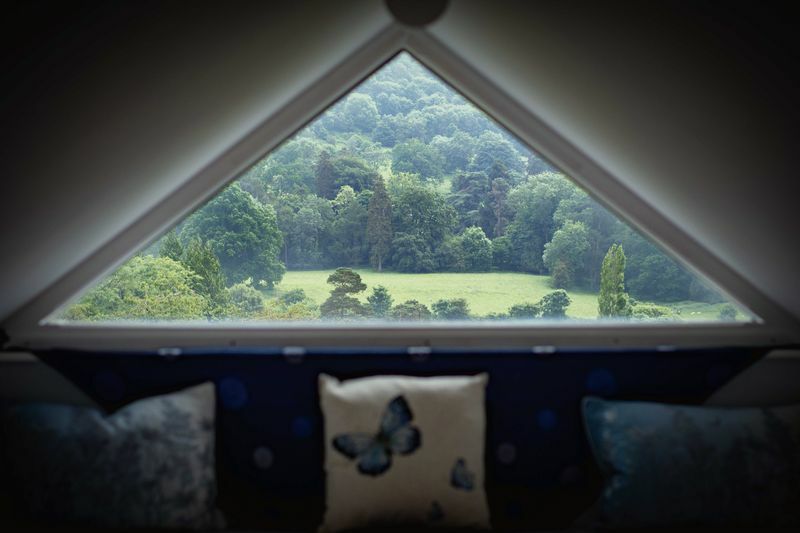 Particularly noteworthy is the triangular window to the end (self-cleaning), beautifully framing the spectacular scenery, it has steps up to a carpeted mezzanine, with additional seating in which to relax and take in the breathtaking views. A further window makes the room bright and welcoming. 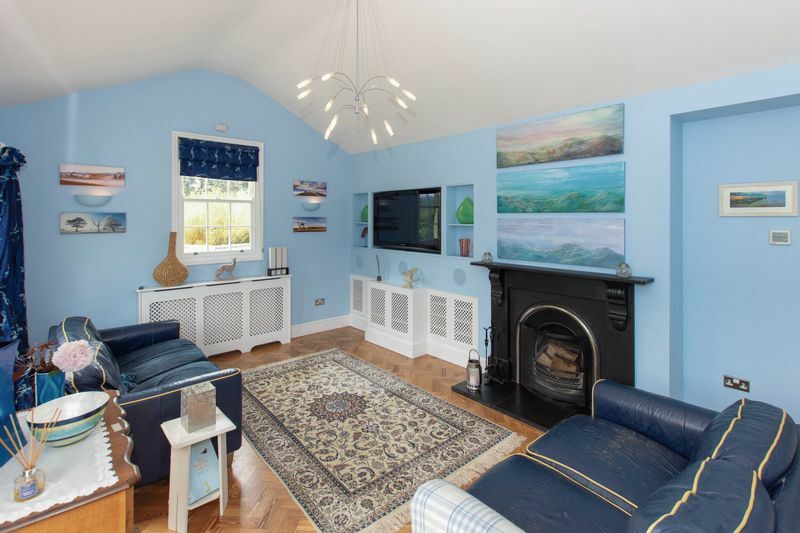 It is finished beautifully with 100% woollen carpets and a radiator tastefully concealed under a wooden lattice cover. 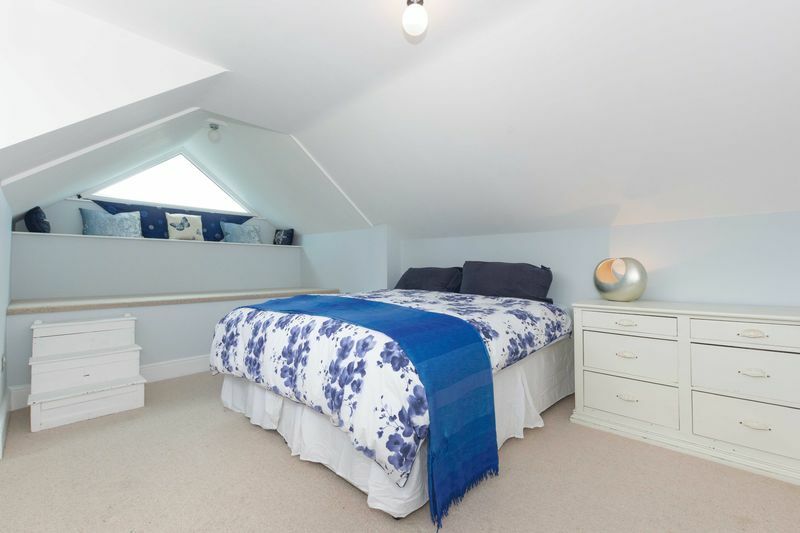 Bedroom 4 – Another spacious bright, double room, located to the right of the landing and offering incredible views of the park land and hills through the landscaped window. Also, carpeted, with attractive wooden radiator cover. 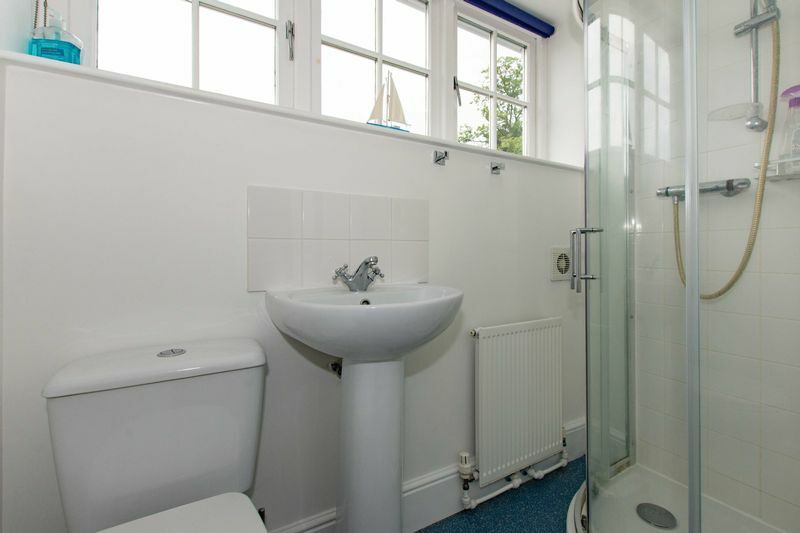 Shower Room – This room services bedrooms 3 & 4 and is located between them both. 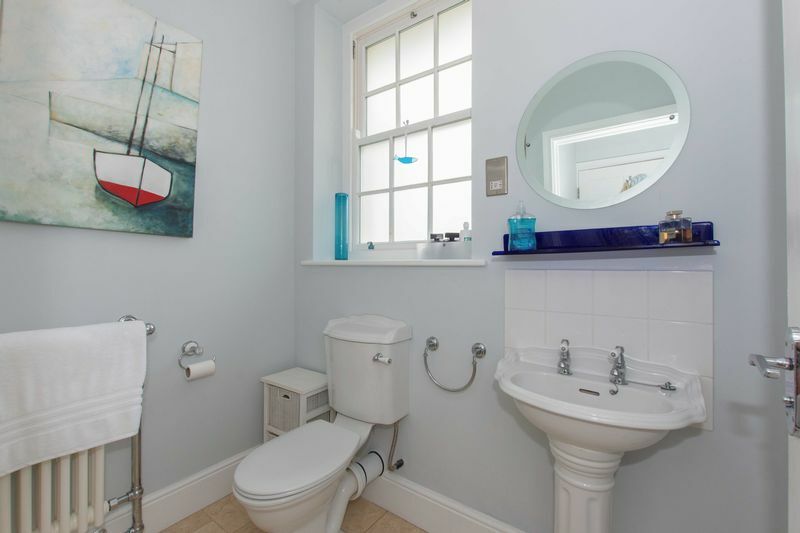 With a plain white suite, including basin, W.C. and rounded shower unit with tiled splash back, it allows natural light in through a double-glazed window at head height. 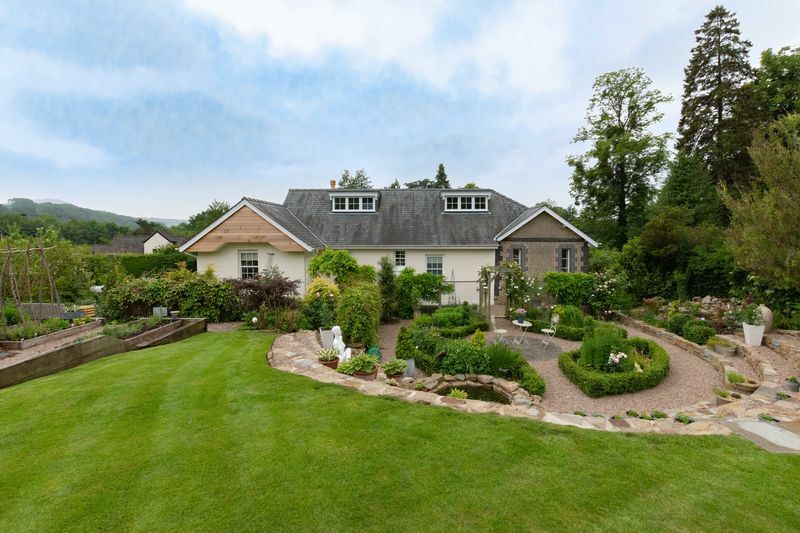 Timbrells sits beautifully in its plot of approximately 1/3 of an acre. 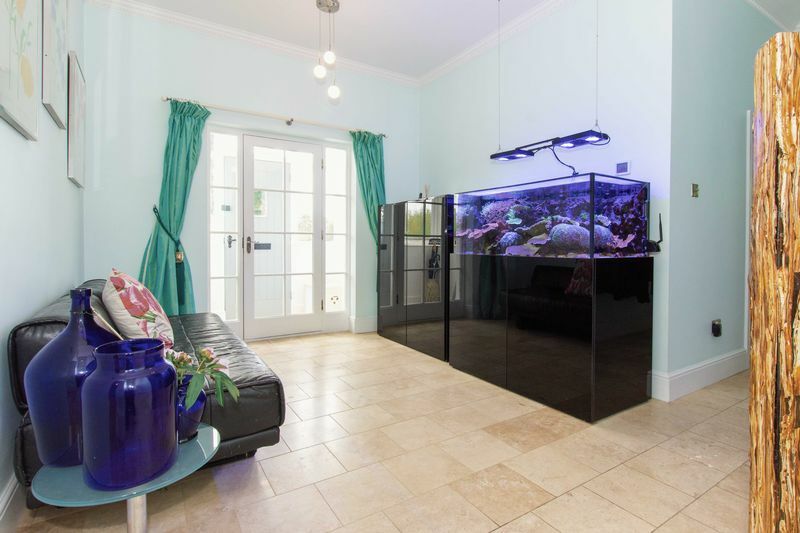 In a very private situation, it has been cleverly designed and is inspired with different areas of interest, allowing maximum benefit of the beautiful surroundings all through the year. 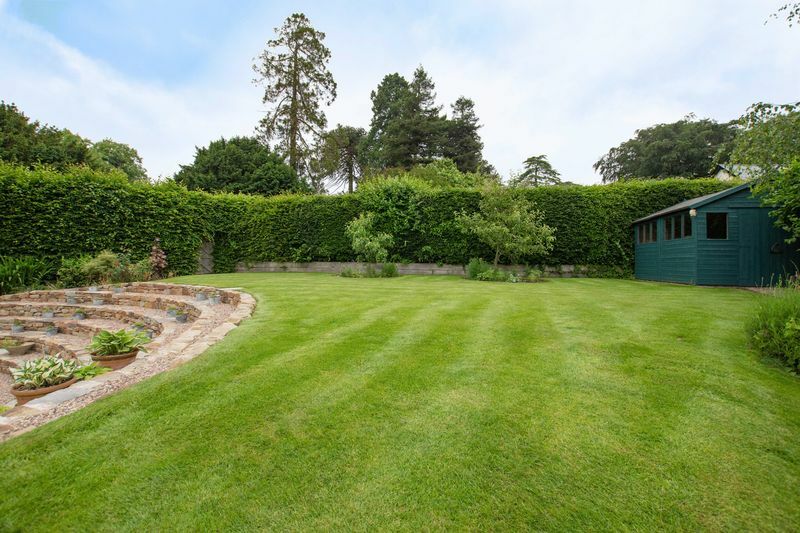 With many mature shrubs and trees protecting the property, it has the added advantage of mature Beech, Hornbeam and Yew Hedging, offering the gardens, total privacy. 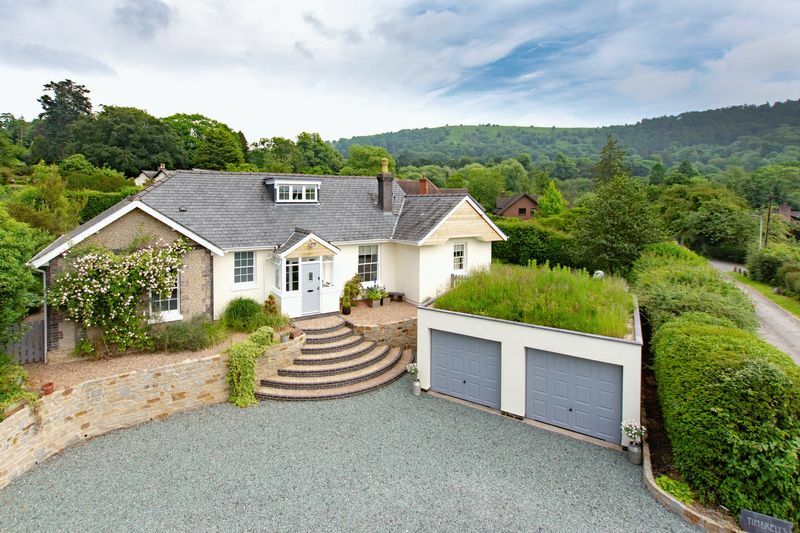 The dramatic backdrop of the Malvern Hills and parkland, give a rural feel. 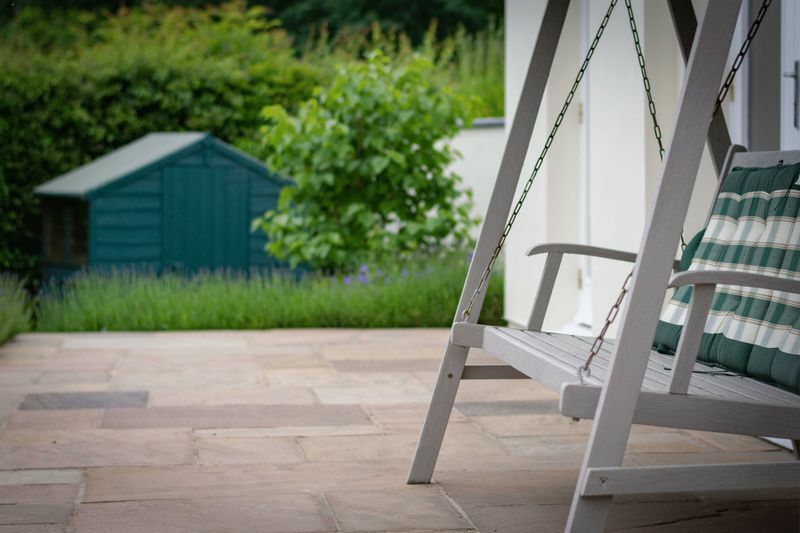 Each side of the property has a pretty wooden picket fence, leading onto a gravel and slab pathway, which in addition lead to the main gardens. 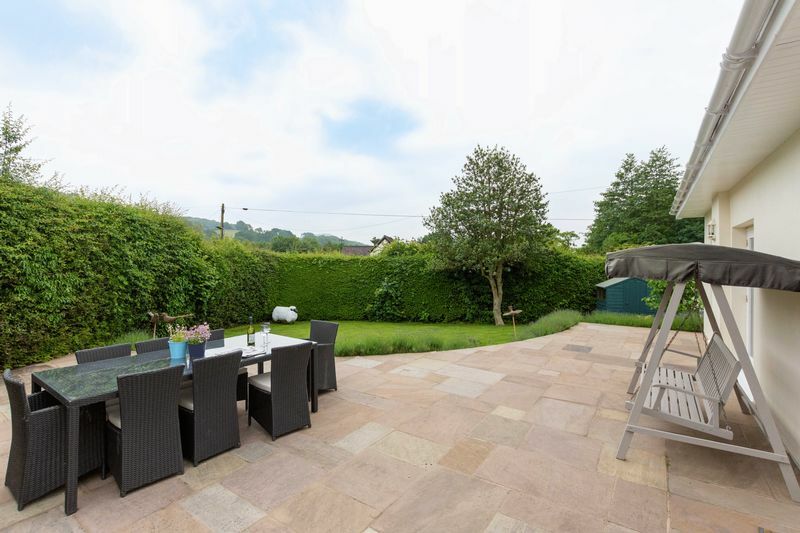 The South garden, has an Indian Sandstone terrace, with uninterrupted views over the Hills to British Camp, this is perfect for Al Fresco dining and framed by lavender with an additional area laid to lawn. There is a small wooden shed tucked away with native woodland plants around it. 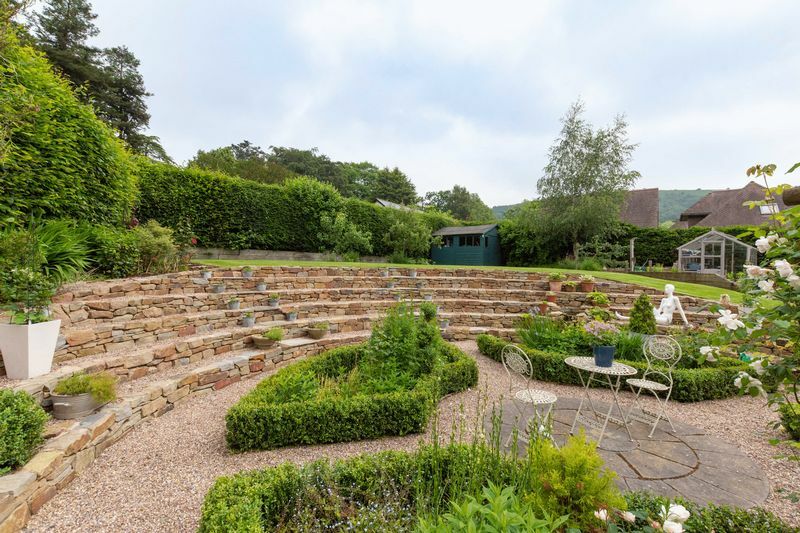 The truly spectacular feature and centre point to the gardens, is the mini amphitheatre in Indian Sandstone, it has been created by the current owner and inspired by The Minac Theatre, in Cornwall. There is an integral waterfall tickling down the natural rock face, into a delightful lily pond. 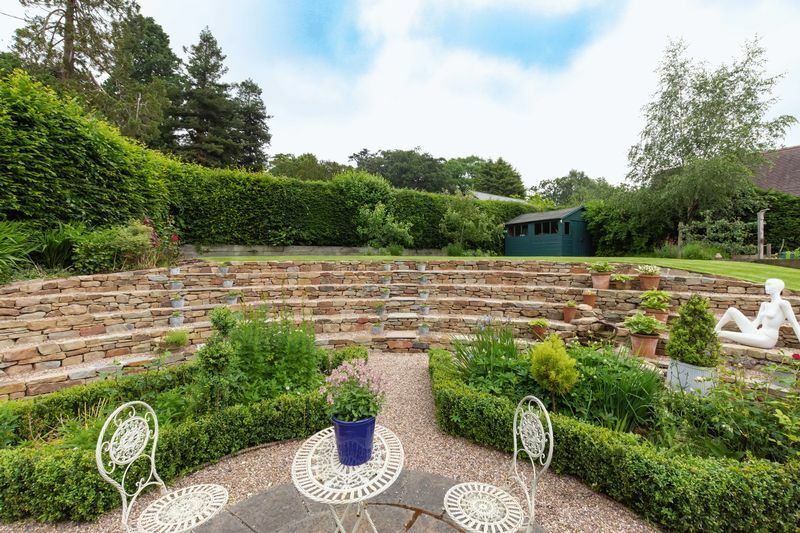 Above this enviable terraced the garden is laid to lawn with ornamental fruit trees, herbaceous and mature shrub borders. 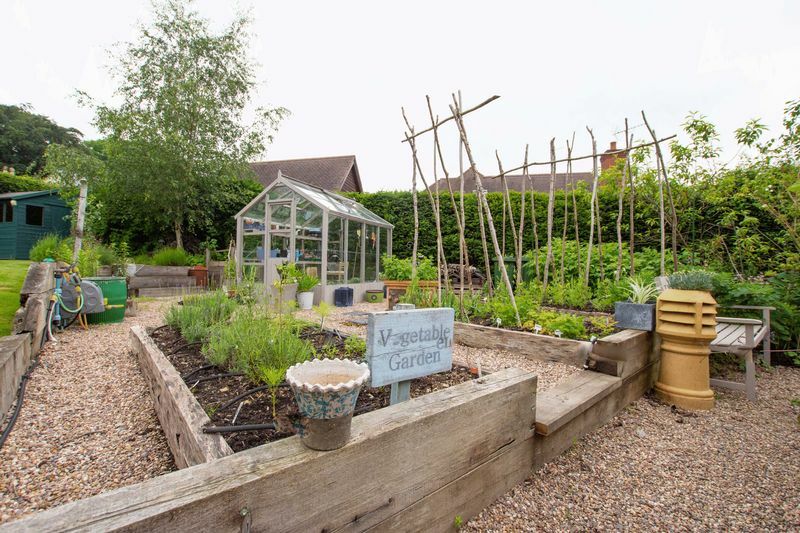 There is a large shed/workshop (10’ x10’) with underground cable for electrical installation, greenhouse (6’x8’) and vegetable garden with raised beds framed by wooden railway sleepers, there are further stunning, uninterrupted views from this area. There are several strategically placed outside lights, plugs and water taps throughout the garden. In addition, a formal, elegant terrace garden with box hedging and climbing roses and clematis is quintessentially English. 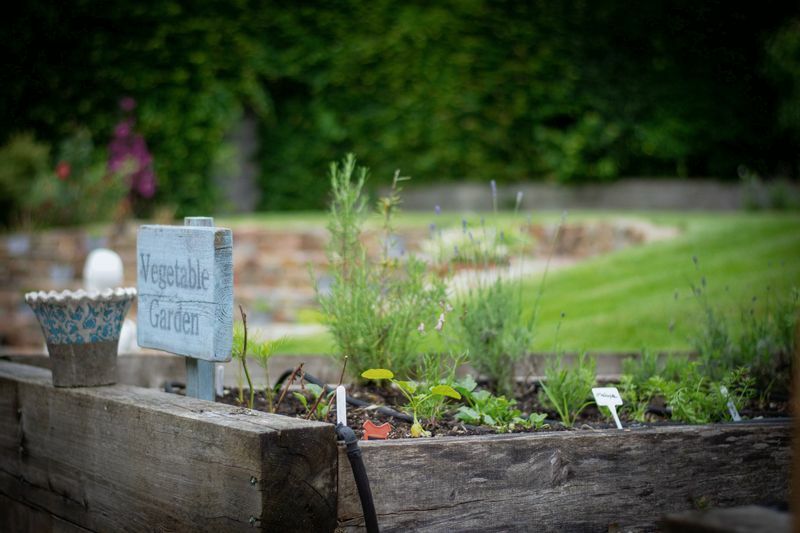 The remaining gardens consist of areas laid to lawn and linked by gravel pathways, highlighting beautiful mature borders that are bursting with colour. From the centre of Colwall village head north west on Walwyn Road towards Malvern. Pass the island with the bus shelter on the left. Broadwood Drive is the next road on the right, opposite the entrance to Old Court Nurseries. The property is immediately on the left.